All the highlights of Norway are easily accessible from one of Norway’s Top 10 hotels, located in Fosnavåg! Directly at the harbour, this hotel convinces you with fashionable rooms and a delicious restaurant with sea view. From here it is never far to the stunning views of Trollstigen, the Geiranger region and the coastal town Ålesund. A bus transfer takes you to your hotel for check-in. On the route from Oslo to Fosnavåg you pass charming landscapes such as the Sognefjord. Here you have the opportunity to visit the Stave Church Borgund which was built around 1180 and consecrated to the apostle Andreas. The architecture is supported by columns and in the whole construction, not a single metal nail can be found! In addition, the church sets itself apart from other Stave Churches through unique characteristics such as gradual construction with round passages and a raised middle room. In the evening you arrive at your hotel in Fosnavåg. Start your excursion to Ålesund, a city stretching over numerous islands into the Atlantic Ocean. Famous for its unique Art Nouveau architecture with a variety of filigree ornaments and towers, Ålesund offers a cityscape worth seeing. Visitors can admire the Ålesund Church which dates back to 1909 with its elegant stained glass and other decorative elements, or enjoy the view from the view point Fjellstua on the city hill Aksla. Today’s excursion leads you to Geiranger. Located on a fjord with the same name, it is surrounded by a breathtaking landscape in the middle of the mountains. 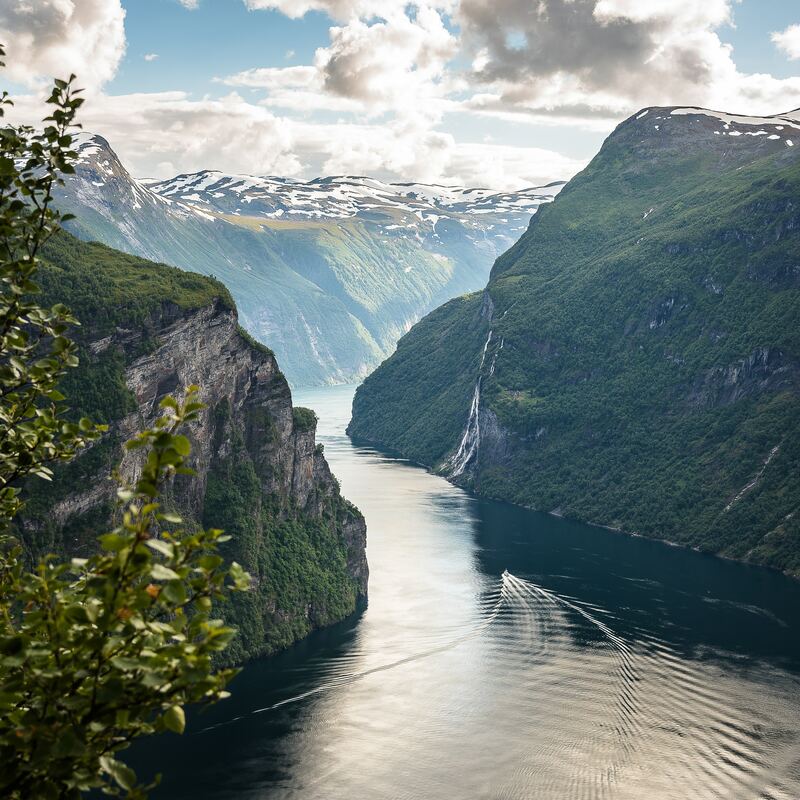 In Geiranger you can admire the snow-covered mountain peaks, wild and glorious waterfalls, lush vegetation and deep blue fjords. Another highlight of the tour is the famous Trollstigen (troll ladder), the most popular serpentine road of Norway. The road with its eleven hairpin curves was finished 1936 after 8 years of work. It received the name from a national legend and the residing trolls in the region. Stop at the waterfall “Storfossen” and the highest located point of Trollstigen and enjoy a breathtaking view into the valley. Relax during a cruise along one of the narrowest fjords in Europe. Surrounded by majestic mountains you will have great views on small traditional farms on the mountainside. Besides, you have the possibility for a ride with the famous Flåmsbana, one of the steepest railway line worldwide on standard gauge. Your overnight stay is located in Geilo. This morning you will set off to Oslo along an impressive scenery. With your local guide you will visit Oslo’s attractions like the Vigeland Sculpture Park, the town hall, the royal castle, the Akershus Fortress, the Museums of Bygdøy and the panoramic views of the city and the fjord from Holmenkollen – the famous ski jump area. In the evening you will be brought to your hotel. The next morning you will be transferred to the airport Oslo-Gardermoen and depart on your homeward journey.